Site description: Kolob Reservoir is located in the headwaters of the Virgin River drainage. The reservoir is managed by the Washington County Water Conservancy District. Although there is no formal conservation pool for sport fishery purposes at the reservoir, the Conservancy District has generally maintained the reservoir at levels sufficient to maintain a sport fishery, and has recently constructed facilities to accommodate recreational use. The reservoir is a popular fishing destination for both local residents and non-residents. In the past, the sport fishery was managed with annual stockings of catchable-size and fingerling rainbow trout as well as fingerling hybrid cutthroat trout and brook trout. Besides stocking, an undetermined amount of natural recruitment of cutthroat trout and rainbow trout contributes to the fishery. Golden shiners and crayfish are also present. Kolob Reservoir was drained in summer of 1996 to repair the outlet. Following the draining, a local sportsmen's group requested a regulations change to promote a sport fishery. The new sport fish management plan was developed in 1997 with input from the Conservancy District, cabin owners in the area and other interested members of the public. The new plan was designed to satisfy the demand for more quality-type sport fisheries, decrease management costs and allow a more efficient use of hatchery fish at other waters. The new plan and fishing regulations was approved and implemented in 1998. In the fall of 2008, a petition circulated by a local cabin owner through Washington County and Cedar City expressed local citizens' concerns that restrictive fishing regulations had severely reduced use at Kolob Reservoir. A 2009 Kolob angler survey confirmed this claim. The petition was presented to the Division's Southern Region Advisory Council (RAC), and the RAC instructed the Division to organize a committee to review Kolob's 10-year-old management plan and give direction on developing a new plan. The committee was comprised of representatives from the local cabin owners, fishing groups, city government, Southern Region RAC and the Washington County Water Conservancy District, with facilitating input from the Division's Southern Region office. The committee identified goals of expanding angler opportunity and use, especially by youth, while maintaining a quality fishery. The committee's proposed management plan included recommendations for new fishing regulations that the committee felt would be necessary to achieve these goals. The proposed regulations included an increased trout limit and adjusted the restricted length slot of 15 to 22 inches. The combination of which would allow anglers to harvest more of the abundant small fish while still protecting larger fish. 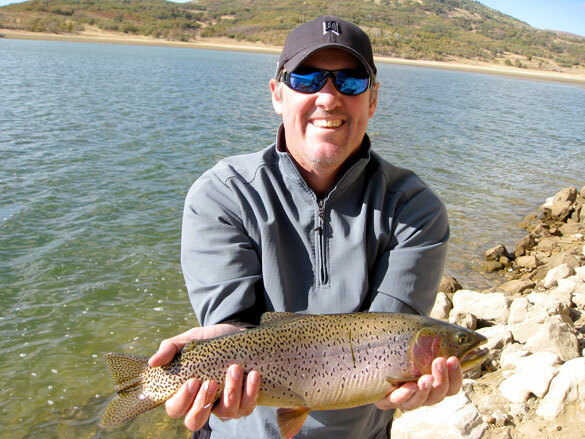 (This regulation has been successful in producing healthy populations of quality-sized trout in other popular Utah fisheries, including Panguitch Lake and Strawberry Reservoir.) The second proposed change was to allow fishing with bait during the summer months, while kids are out of school. The Division accepted the committee's proposed management plan and recommended it to the Utah Wildlife Board. The Board approved the plan and the regulation changes, which were officially implemented on January 1, 2010. The new management plan includes a trial implementation period of three years. During the period of 2010-2013, the Division will monitor the trout population closely to ensure that the new management plan's objectives are being met and that the new regulations are not having an adverse effect on the population. After the initial three years, the management plan will be reviewed again and any necessary adjustments made. In addition, another angler survey will be conducted in 2013 to measure changes in angler use, harvest and catch rates, etc. Kolob Reservoir is generally accessible by vehicles from early April through December. Access from the south (through the town of Virgin) is generally possible two to three weeks earlier than from the north (Cedar Canyon). There is usually fast fishing as soon as the ice comes off for larger trout cruising the rocky points and dam looking for spawning areas. Wooly bugger patterns are popular with flyfishers using float tubes. Shore anglers do well with spinning gear and a variety of lures or jigs. By late June, many fish move out deeper and flyfishers using sinking lines with bugger, nymph or emerger patterns have success. Hatches also start with phenomenal surface activity at times. Boat anglers have success trolling with a variety of lures. Based on past surveys, the fastest fishing for the year occurs in October. Crayfish imitations are effective all year, but can be particularly deadly in the fall. To see what statewide or special regulations apply to this waterbody, please read the current Fishing Guidebook.